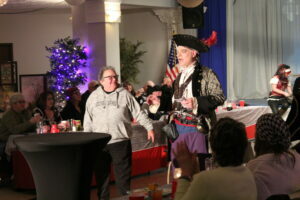 The interactive dinner theater show featured people dressed as pirates. LEWISTON — Every seat was filled Saturday evening at the Gendron Franco Center for the Buccaneer Banquet, an interactive theater performance where those in attendance experienced pirate-themed entertainment while eating a multi-course meal. The banquet, entering its second year and organized by the Franco Center, invites people to Heritage Hall — in regular or pirate-themed attire — to watch a performance by a group of volunteer actors who dress up as pirates and perform scenes on stage and on the dining room floor. The show centered around Captain Broadside and his motley crew of pirates on the General Malaise and the trouble they get into after kidnapping the daughter of a local governor. Sporting pirate-like names such as Iron Bottom, Pinch, and One-Eyed Ruby, the actors would occasionally walk off stage and wander through the dining area, acting inches from where people sat eating their food. Halfway through the performance, after the main course had been served, the show turned interactive, and audience members were invited on stage to perform a series of games with the actors, including seeing who could collect the most money in a sack, or build the fastest pyramid of beer glasses while blindfolded. Wallace said he started acting after his daughter convinced him to try it out. At a cast party for the show, Martin, impressed by Wallace’s accents, asked if he wanted to participate in an interactive theater performance with a medieval twist. Since then, Wallace has performed in a number of Community Little Theatre productions. He was also cast as the villain of “The Damned One,” a 2017 film directed by Colby Michaud and filmed in Lewiston and Auburn. After the show ended, Pat Hogan of Kennebunk who participated in one of the games, came up to Wallace and thanked him for the show. Wallace said it’s reactions like Hogan’s that make interactive theater so much fun to do. “It’s just a great way to interact with the audience, and have them give it right back to you,” he said.